Now that I've been on summer vacation for nearly a week, I figured it's time to introduce you to some new things happening on Wear Abouts! I am on TWITTER!!!! Follow me to stay updated on giveaways and posts! I am on PINTEREST!!!! Follow me to see pictures that are inspiring me! SHOP MY CLOSET!!!! I'll continue to add more in the coming weeks. It's all priced low! And if you email me before you buy it, let me know you follow my blog and I'll take shipping costs away!! To celebrate, I have a fun giveaway for you! 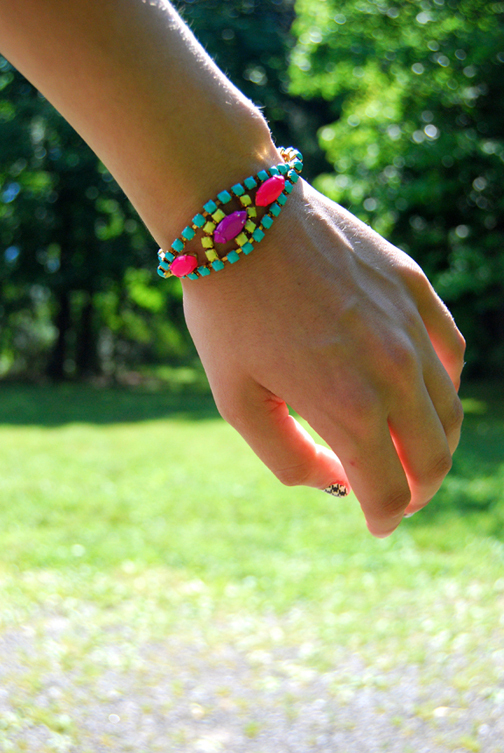 See this hand-painted, colorful, summery, AWESOME bracelet from Marcella Leone? You can win it! Enter the Rafflecopter form below!! Whoa, that skirt! Haha, that's so fun. Definitely will make people stop to read it. And I love that Crash & Burn top on you. The back has such fantastic details! Oh my goodness, your skirt is so perpetually adorable~! Urban Outfitters did a good job. :D It's so very unique and I love it with that black and white striped blazer. The back of your top is way neat, too. PS) You are the sweetest thing ever! I use a tripod and adjust the camera's settings, but my mom tags along with me (for safety, haha!) and pushes the button to take pictures for me. :D Teamwork! Wow! You've been up to a lot! lol Loving that skirt! It's too fun! Love your blazer & bracelet! I'm checking out Marcella Leone's shop now & it's amazing. Thanks for the heads up. love your skirt and top. Ohh, did I not answer that?! Silly me! My news lens is a Canon EF 100mm f/2.8! You can find it on Canon's website. :D 'Twas expensive, but worth it, especially if you like macro photography. Love the striped blazer and graphic skirt together! Super cute(: Maybe we can follow each other?? that top is beyond cool! That bracelet is my favourite part! Great skirt and lovely neon bracelet! I've been eyeing that skirt for a few days, curious about how it would look on. I like how you styled it. I want your skirt and bracelet!!!!! Hoping to win this giveaway!! !